Turning on our porch light to admire our long day of yard work, we couldn't help but appreciate the subtle bursts of lightening forming on the horizon. The gentle drizzle of rain combined with the aroma of a bonfire’s dying embers summed up the ideal fragrance of a perfect summer night. “To accomplishment!” we toasted, preparing to clink our glasses…. “#&@#!! 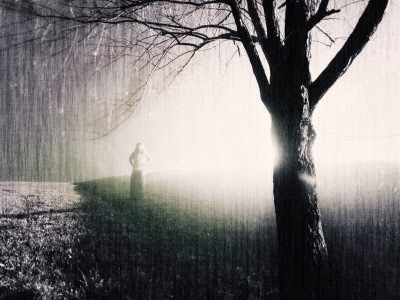 !” I muttered under my breath…..
“What the heck?” My daughter moaned, “it’s not even storming…..I hate this…” her words trailed off as she headed toward the kitchen to retrieve a flashlight. The blackness tried to taunt us, but it had lost its power. We’d learned, over time to maneuver quite adeptly in the darkness, and were always prepared with flashlights and candles. In less than a moment, our shadows flickered and danced mockingly on the walls!! I smiled. “Improvise, Adapt and Overcome!” I pictured my husband boldly pronouncing these words. Yes, I know they belong to Clint Eastwood……but John had somehow made them his own. “You’d be proud of us.” I said out loud….but my triumphant words were cut short. Out of the silence it came……a heart piercing, blood curdling, indescribable screech that can only be defined as a scream!! In a matter of seconds, adrenaline had taken over my body and brain completely….there was no time to think. “What are you doing, Ma?” My daughter screamed as I rushed out the door. “Call 911!” I yelled back, dashing toward the house across the street. The baby…..all I could think of was the baby. Sucking in a deep breath, I swallowed hard, and then let it go as I made my way to the door. We had waved back and forth several times, but had never actually spoken. What if she doesn't speak English? I wondered. How will I communicate?…..What will I do if she needs help with the baby? As I reached the porch I could see inner door was wide open. My ears perked up….Did I hear something? In my peripheral vision I caught it, a flash, a flicker….a cigarette perhaps? I didn't know……but for the first time I was frightened. The reply of utter silence gripped my soul with a fear more aggressive than the scream itself. Letting go of the door knob, I had a decision to make. Run in! A bloodcurdling scream? I can't wait to see what you are going to do! Oh how I love cliffhangers!!! I sit in wait for your response, your ending! Great piece of writing! Oh my I read this twice to see if I had missed a piece....no please don't stop! I want to know what happens. You asked what you would do....probably pee my pants or passout! Ha ha......I love, love, love all of your responses. I promise to post the rest of the story very soon and thank you for making me smile on this Monday morning! !